Design + MBA = ? I am a product designer and a user researcher. And I also happen to have an MBA which is focused on analytical thinking, finance and accounting, strategy, operations, marketing, hr etc... But what has any of that gotta do with designing a product? Designers create products and services. Products and services drive businesses. And companies are made of businesses. Most likely, not many (if any) people in your company have a deep understanding of the business side of things, while also having a deep sense of how to build products people love. That is why a designer with an MBA can really help a company thrive. Your company is trying to figure out how to make money. As a Product designer with a good understanding of different monetization strategies you are in prime position to make an impact. You can channel your desire to serve the user with your desire to build a strong business. You can pursue out of the box solutions to make money within the product you are creating. For example, you may look into unit economics, or into extending the lifetime value of your user through design. That in turn will make revenue feel like a natural part of the product, instead of something that was tacked on later as an afterthought. You will be actively leading or participating in your team’s monetization strategy and decisions. Your company is resource constrained. You want to build a feature you believe will really improve the experience in your product, but to do so you need to pull resources from another team. That is a tough fight. Because you understand negotiation principles and finance, instead of making an argument about what you want to do, you turn it into an argument about how this feature will impact the business. You create a great presentation with your own revenue projections and cost benefit analysis, showing how over time, this feature will pay for itself. You show how this short “borrowing” of resources will have a lasting impact in both the experience and the bottom line. 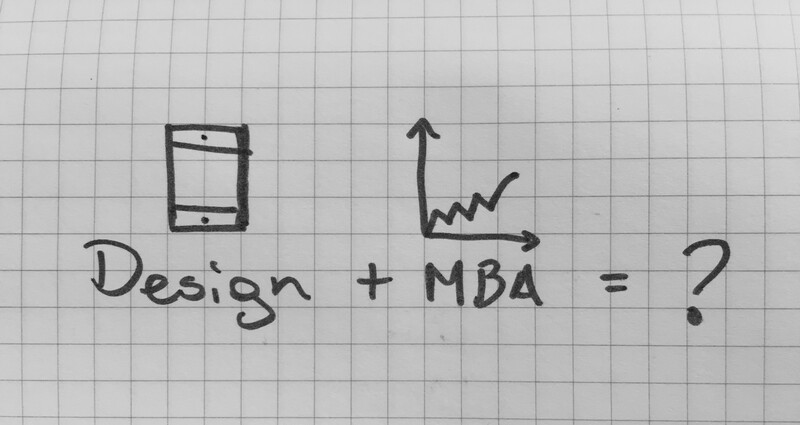 Design + MBA = a more impactful designer. Do I have to have an MBA to do these things? Of course not. You can learn by doing, but usually a designer is not exposed to unit economics, monetization strategies, operations, accounting or finance while they are designing or doing user research. 2) Should every designer get an MBA? That is my take. What are your thoughts?